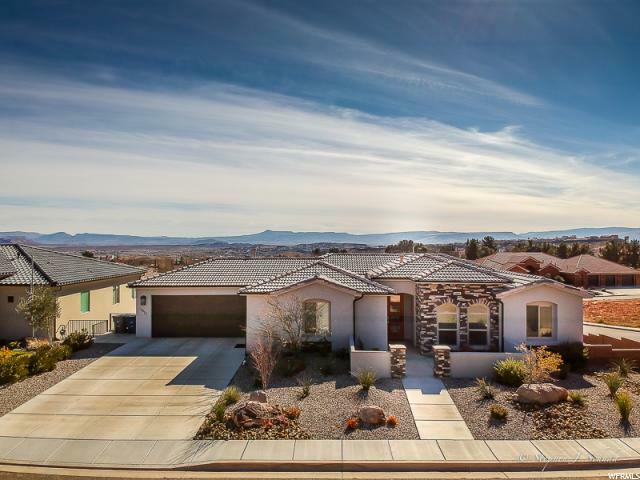 All ESCALERA homes currently listed for sale in St. George as of 04/19/2019 are shown below. You can change the search criteria at any time by pressing the 'Change Search' button below. "Fantastic curb appeal! This corner lot, custom built home with all the extras offers beautiful, sweeping views of the city, red rocks, and surrounding mountains. This home boasts two (2) full kitchens, two (2) laundry rooms, a mother in law apartment, and ample storage space throughout. Quartz countertops, 5-inch baseboards, two tone paint, recessed lighting, tile showers, and many more upgrades! 3rd Car Garage Bay is being used as a home salon. It can very easily be turned back into a 3rd car garage bay. Buyer to verify all information, deemed reliable, however buyer to verify all info including utilities & HOA information if applicable."